Talk about déjà vu. As the two men are left alone in the Oval Office, Johnson accuses Nixon of colluding with the South Vietnamese to prolong the war until after the election. Nixon doesn't deny the charge; rather, he counters by pointing out that Johnson might have gotten such information through illegal wiretaps. Remember, this play debuted in 2014. Fichandler Stage, Arena Stage, Washington, D.C.
Lyndon Johnson (Jack Willis, behind the desk) lectures Congressman Wilbur Mills (Tom Wiggin) in Arena Stage's production of Robert Schenkkan's The Great Society. Photo by C. Stanley Photography, Arena Stage. Lyndon Baines Johnson, played by the incomparable* Jack Willis (*really), walks onto the Fichandler's stage at Arena Stage in Washington, D.C. When he was a little boy, he tells us, his daddy took him to the rodeo, and the bull riding fascinated him most. "They released the gate and 2,700 pounds of horns, hooves, and hate exploded into the arena, twisting left and right, bucking up and down," he says. "Everybody gets thrown. Everybody." Some suffered broken backs, some the bull gored, some were killed. "Why would anybody do that?" Willis's LBJ asks rhetorically. The why, he says, was in that one moment in the short ride when young Lyndon could see the cowboy's face. "Maybe it was a trick of the light, but there was such a look of joy, of triumph," he says. "So, check your grip, take a breath, because here we go." And here we go, indeed, into The Great Society, Robert Schenkkan's sequel to his intensely rewarding and much-awarded play, All the Way. That first play chronicles Johnson's first year in office when he bullies the Civil Rights Act through Congress and helps desegregate the Democratic Party en route to his nomination and subsequent re-election to a full term in 1964's landslide election victory. The Great Society covers the rest of Johnson's presidency, a four-year bull ride that leaves him eviscerated and two other stars of equal voltage in the political arena killed. 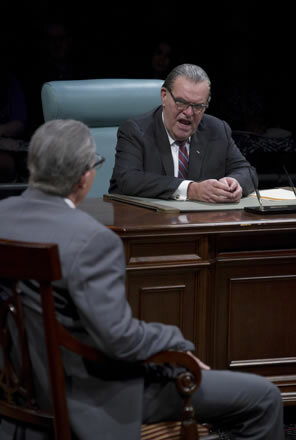 As with the first play, The Great Society comes at us in quick bursts of scenes covering historical events and behind-the-scenes politics centered on LBJ. While Martin Luther King Jr. (Bowman Wright) shares the spotlight equally with LBJ in All the Way, his role lessens in the sequel as events and personalities crowd the stage, overwhelming Johnson himself. Because The Great Society covers more ground (from Selma and Chicago to Da Nang) over a longer time span and with more outsized personalities than All the Way, it feels less focused. This Arena production, in fact, significantly trims the play that debuted in 2014 at Oregon Shakespeare Festival, reducing a three-act piece to two acts. The lack of focus could also be form reflecting theme as Johnson loses his sharpness as The Great Society progresses. He still has his political tricks and witty repartee: "It's time somebody finally de-nutted that dog," he says of Alabama Governor George Wallace; "You know the difference between cannibals and liberals? Cannibals only eat their enemies," he says of Northern politicians who support desegregation everywhere but in their communities. After awhile his anecdotes become more pedantic, and he himself wilts under paranoia and the political weight he created, and The Great Society ends up playing as a modern-day Shakespearean tragedy. It's a tragedy that passes beyond the fates of Johnson, King, and Bobby Kennedy and becomes our tragedy. "The Great Society" ideals that Johnson's legislation achieved eroded due to financial incompetence and were ultimately blunted by political greed and intransigence, not to mention basic human nature. By 1968, the escalating Vietnam War was sparking massive protests across America, the Civil Rights movement had devolved into riots, and the government was facing a rising debt crisis. When Richard Nixon (Cameron Folmar) sits at the Oval Office desk and tells Johnson, "I'm going to change this country; I'm going to make it great again," sick laughter winds through the Fichandler audience. Not only are the social, economic, and security issues of 1968 still embroiling us 50 years later, a dread sense of déjà vu pricks those of us who lived through that tumultuous 1968 election and the half-dozen years that came after. Much of the talent that staged All the Way at Arena in 2016 is back again for The Great Society, helmed, as was the initial play, by Kyle Donnelly. Kate Edmunds has again turned Fichlander's theater in the round into the Oval Office with the Great Seal of the United States on the floor, but the stage also has grates through which flames rise during the riots and the self-immolation of a war protestor. Actors and crew move furniture (desk, beds, chairs, podiums) on and off the stage quickly to establish different settings for various scenes. Gone are the banks of TV screens used in All the Way to show historical events and statistics; instead, screens on the walls behind the four audience seating areas identify the place and time of the historical events enacted on the stage. Underneath that information, as if an afterthought, is the rapidly rising number of U.S. dead and wounded in Vietnam at that point in time. Key members of Arena's All the Way cast, in addition to Willis and Wright, reprise their roles for The Great Society: Desmond Bing as Civil Rights activist Bob Moses, Richmond Hoxie as FBI Director J. Edgar Hoover, Susan Rome as Lady Bird Johnson, Craig Wallace as King confidante Ralph Abernathy, and Folmar as Alabama Governor George Wallace in addition to Nixon, who doesn't appear in All the Way. Another character, oft-mentioned but physically absent in the first play, comes to breathing life in The Great Society: Bobby Kennedy played with ferocious intensity by John Scherer (in Arena's All the Way Scherer played LBJ's ever-mild and ultimately disgraced aide Walter Jenkins, who gets a brief but poignant mention near the end of this play). Two cast members in the first production assume roles that have been greatly expanded in the sequel: Tom Wiggin (Stanley Levison in All the Way) takes over as Defense Secretary Robert McNamara, and Lawrence Redmond (Richard Russell in All the Way ) is now Vice President Hubert Humphrey. Willis is the key returnee. He originated LBJ in All the Way at Oregon Shakespeare Festival in 2012, and though Bryan Cranston took over the part for the Broadway production in 2014 and won a Tony for it, I've always thought Willis played the part with deeper authenticity while capturing the mythical LBJ presence (more bull than cowboy). Seeing Willis back in that part in Arena's production of All the Way solidified my opinion. In fact, he so owns this role that I can't think of LBJ without seeing Willis's face—even the picture of the real Johnson on the program cover looks wrong to me— and watching his Johnson disintegrate before our eyes is heart-wrenching. Johnson was a master politician, ruthless in the way he wielded his power. It's fun to watch him publicly trip up the American Medical Association, undercutting its opposition to Medicare (of the AMA's counterproposal for a voluntary enrollment health system, Johnson says, "That's not elder care, that's I don't care"). When in a joint press conference Wallace announces that Alabama doesn't have the financial capacity to protect the Selma marchers, reneging on a deal he had made with the president, Willis's Johnson looks coldly at the grinning Wallace before taking over the microphone and reporting that because of Alabama's financial situation, on Wallace's "personal request, I have reluctantly agreed to federalize the Alabama National Guard" to protect the marchers. Folmar's dumbfounded Wallace tells his aide, "Get me the hell out of here before he announces I'm in favor of civil rights," spitting out the last two words as a disgusting sin. Johnson genuinely believed in enfranchisement for all, a belief instilled in him as a young teacher in Texas with a classroom of poor immigrants. After pushing through the Civil Rights Act during an election year, he advanced his war on poverty with his Great Society programs of welfare, Medicare, education assistance, housing programs, and, ultimately, the Voting Rights Act. On such social issues, Schenkkan shows Johnson's morality driving his politics: His ruthless bullying, deal-making, and slight-of-hand maneuvering are all means to a moral end. He has a mutually respectful friendship with King as they work in testy tandem toward their shared goals. King is under pressure to use direct-action protests while LBJ prefers working legislation through a politician's calculated timeline. The sometimes-fatal consequences of King's course—using nonviolent protests that are met with lethal police brutality—ends up moving LBJ's political needle faster. Johnson even uses the phrase "we shall overcome" when he introduces his Voting Rights Act. Both Johnson and King then make key mistakes that lead them into their own quagmires. Both, in different scenes when asked by a key advisor what they are going to do next, respond with "I have no f***ing idea." Johnson's great tragic flaw as president was Vietnam, where he let politics drive his morality, and the means never reached an end. As McNamara promotes a "graduated system" of increasing military pressure on the North Vietnamese, the audience, with 20-20 hindsight, chuckles at the naiveté of it all. Willis's Johnson has the foresight to see where it all might head, but he more fears looking weak on communism. With Walter Cronkite's famous commentary on his CBS Evening News turning against the Vietnam War (actual footage of it is shown on the screens above the audience as Willis watches a TV on stage), Johnson is defeated. "When you've lost Cronkite, what is there?" he asks. A month later, March 31, 1968, he's on national TV himself announcing that he would not seek re-election. In addition to losing his grip on Vietnam, Johnson loses his way on his own social programs because he ignores the nitty-gritty of financing them: not merely on how much they cost, but how much of the money ends up funding patronage programs by the likes of Chicago Mayor Richard Daley (Andrew Weems). Schenkkan portrays Johnson's diminishing political clout in two mirror scenes. In the first, Johnson physically assaults Congressman Wilbur Mills (Wiggin), chairman of the House Ways and Means Committee, for holding up budget legislation, leaving Mills shaken and chastened. A few scenes later, it is Wiggin's Mills who gets in Johnson's face, threatening the president to come up with meaningful and specific cuts and taxes before he'll move on the vote, and Willis's shaken, chastened LBJ acquiesces. While Hoover, Iago-like, needles Johnson into distrusting King, Willis turns his character's gurgling self-esteem issues inside out when he berates Humphrey for assuring him "we're in this together." "There is no we in this, there is just me, the president," Willis roars, advancing threateningly on his vice president. "And you will do as I say or you will find yourself swabbing toilets over at the Pentagon with a goddamn Q-tip." This salvo signals Johnson's rapid slide into a paranoia that is Nixonian in its breadth. 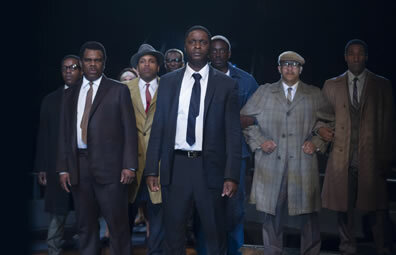 Top, Martin Luther King Jr. (Bowman Wright, center) leads marchers over the bridge at Selma in Arena Stage's production of Robert Schenkkan's The Great Society. Above, Lyndon Johnson (Jack Willis, with umbrella) lectures Senator Robert Kennedy (John Scherer). Photos by C. Stanley Photography, Arena Stage. Meanwhile, King turns his attention toward Northern cities and the housing discrimination Johnson's legislation was supposed to address, even moving his family into the projects in Chicago. Wright's King, who displays his own political savvy in outmaneuvering a trap Wallace sets for him in the Selma bridge showdown, isn't prepared for the virulence of the racism he encounters in Northern cities. He not only underestimates the toxicity of white resistance, he underestimates black anger and the hold of the Black Power movement. Rather than experiencing nonviolent protests, the inner cities blow up in rioting. This backlash—as even his wife turns against him—sends King retreating back to his home base in Atlanta while saddling Johnson with a public cry for "law and order" that the Republicans ride to victory in midterm elections and, eventually, the White House. The play jumps from Johnson's March 31 announcement to December of that year as the Nixons (Megan Graves playing a deer-in-the-headlights Pat) visit the White House. Talk about déjà vu. As the two men are left alone in the Oval Office, Johnson accuses Nixon of colluding with the South Vietnamese to prolong the war until after the election. Nixon doesn't deny the charge; rather, he counters by pointing out that Johnson might have gotten such information through illegal wiretaps. Remember, this play debuted in 2014. The two men do agree on something that I consider even more important. Johnson says that he gave the information to Humphrey, who was running neck and neck with Nixon. Humphrey didn't want the information released, Johnson says, quoting Humphrey that if he won the election, "everybody will always say I only beat Nixon because of that," and if he lost, "Nixon won't be able to govern because half the country will hate his guts." "He's a good man, Humphrey," Folmar's Nixon says. "Yes, he is," Willis's LBJ agrees. The implication: Good men can't be elected president of this nation—or, at least, they don't last more than one term. 1968's two epochal assassinations are represented in haunting flashbacks as Nixon brings them up. First, Wright descends the steps through the audience on one side of the theater, speaking King's final words from the balcony of Memphis's Lorraine Motel to a friend, saxophonist Ben Branch: "Make sure you play, 'Take My Hand, Precious Lord' in the meeting tonight. Play it real pretty!" Then, Scherer descends through the audience on the opposite side, speaking the final lines of Kennedy's California primary victory speech before leaving the podium to exit through the kitchen of Los Angeles's Ambassador Hotel: "I thank all of you who made this possible, and on to Chicago and let's win there!" 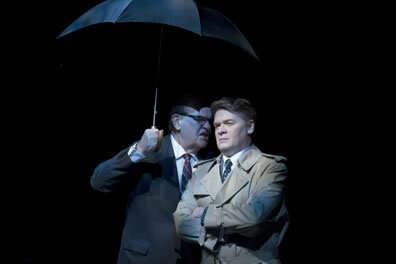 As both Wright's King and Scherer's Kennedy remain in their places in the audience, Willis's Johnson speaks the play's final words as Nixon assumes the presidency: "Lets go home, Bird." Johnson survives his bull ride, but his fall was fatal to his legacy. Seeing how little we've progressed in 50 years and how swiftly we've regressed into tribal politics in the past 10 years, I've chosen for my final words of this review to borrow those most influential words spoken to a national audience on the evening of February 27, 1968. "It is increasingly clear to this reporter that the only rational way out then will be to negotiate, not as victors, but as an honorable people who lived up to their pledge to defend democracy, and did the best they could. This is Walter Cronkite. Good night."